Honoré Daumier, Un parricide – Ein Muttermörder (A Parricide - A Mothermurder), 1850. Two of the creators of the most incisive and critical drawings in art history join up in an exhibition for the first time: Honoré Daumier (1808 – 1879) and Raymond Pettibon (born 1957). In their oeuvres, the two comment with satirical acuity and great wit on the events of their respective epochs. The works of both artists focus on politics and society, the everyday and current events. Honoré Daumier was a graphic artist, produced drawings and paintings, and in his day was famous above all for his caricatures. 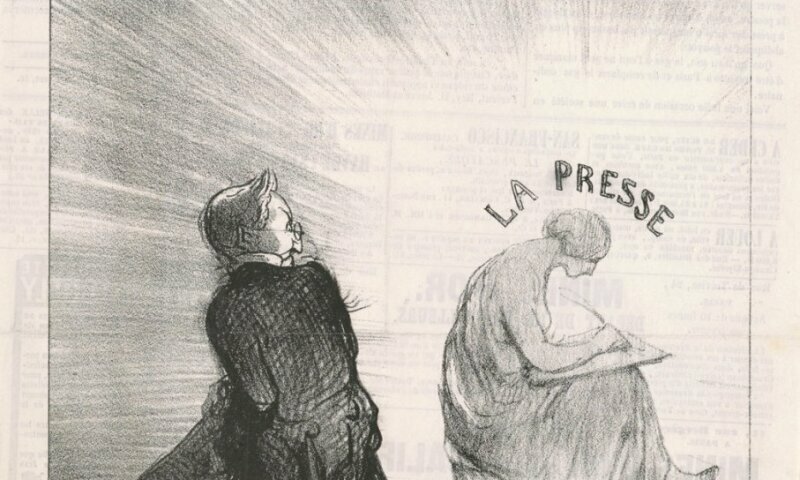 His political and social commentaries reached the entire population through the illustrated dailies of the time, making him one of the most important chroniclers of 19th century France. As a sharp-eyed observer with an incredible talent for drawing, realist Daumier created one of the most impressive artistic achievements of the era. The exhibition gives a comprehensive display of his oeuvre, with some of his paintings and sculptures also on show and alongside the renowned prints. Raymond Pettibon, an American, has produced an equally radical body of work commenting on his times. With cutting wit, his pen addresses issues in the worlds of politics, religion and sports, and at times even literature. His output on paper sheds a sharp light on the reality of the American dream and the nightmarish distortions it undergoes. His collages of texts and images are imbued with biting humor and a deep skepticism toward the “American Way of Life” that so defines politics and society in the United States: In his mirror world of sharp black-and-white contrasts, Pettibon mercilessly explores the depth of depraved reality, painting his figures with a broad brush that leaves them shadowy in feel. The juxtaposition of Daumier and Pettibon surprisingly highlights how much they have in common: critical minds, precise drawings, the combination of word and image, as well as their formal and substantive daring. Bringing their trenchant artworks together in one place offers an enriching experience, as each reciprocally sharpens the eye for the other, such that these two outstanding artists foster a highly topical dialog between the 19th century and today.